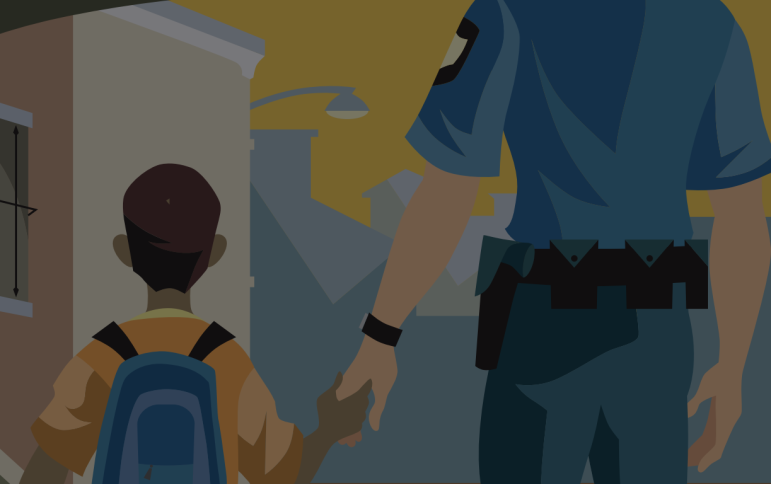 Each year in the United States, several million children witness the arrest of a parent. These arrests are most likely to be for domestic violence, drug-related incidents and property crimes, according to a report from the Office of Justice Programs Diagnostic Center, an agency of the U.S. Department of Justice. The experience can be excruciating for children. “It turns their world upside down,” said Lisa Thurau, founder and executive director of Strategies for Youth: Connecting Cops & Kids, a Cambridge, Mass.-based nonprofit that provides training to both police and youth. “[Children] often want to see domestic violence against the mother stopped, but the way the police conduct the arrest … can scare and traumatize them,” she said. The majority of police departments don’t have protocols that guide police in dealing with children at the scene of an arrest, she said. “Police are not supported or equipped to address the interaction with children,” Thurau said. In some cases, children have come home from school and found no one to care for them because parents were arrested. In addition, police are often not trained to recognize the signs of trauma in children and youth, she said. Thurau’s report describes model practices that make arrests less traumatic for children. The guidelines call for police to make sure children are accounted for and left with competent adults. Police should have contact with social workers and child advocates to connect the children with services they may need. Police should avoid pointing weapons at children. Police should avoid handcuffing compliant parents in front of the children. When police have secured the situation, they should let parents comfort their children and explain what has happened. Police in Manchester, Conn,. are already using a set of procedures developed by researchers at the Child Health and Development Institute of Connecticut. Manchester police carry a reference card that guides them in taking steps to deal with children. The department has a partnership with a team of six therapists, who can come to the location of the arrest and assist with the children while police are dealing with the adults, according to a January 2014 article in the Hartford Courant. The therapists also follow up with the family, according to the article. The first job of police is to stop violence or potential violence and make necessary arrests, Manchester Police Lt. Sean Grant told the newspaper. After that, police can consider the effect on children, he said. Arrests “can be very troubling, confusing and scary to [children] because they don’t comprehend if their parent is ever coming back,” Manchester police spokesman Capt. Christopher Davis told the newspaper. It will be discussed at their conference in October, Thurau said. “It’s really in the hands of police chiefs to show leadership,” she said.